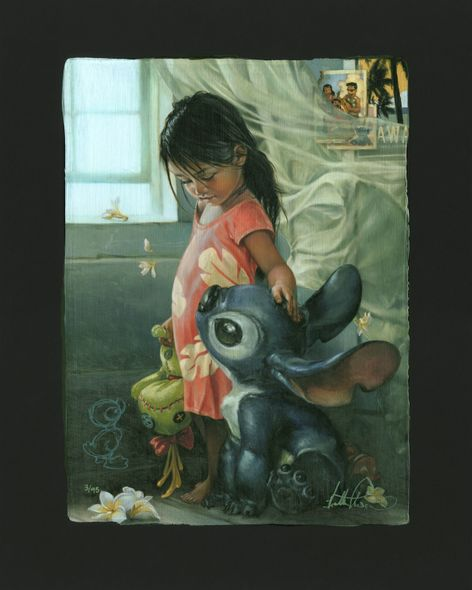 Heather Theurer Remarque Limited Edition Chiarograph on Black Paper:"Ohana Means Family *FREE Custom Framing Included*"
Edition: Artist Signed and Numbered Limited Edition to 95. Personally Hand Remarqued by Heather Theurer. About the Artist : Some stories begin on well-defined roads or with billboard accomplishments. But the story of an artist usually begins somewhere less noticeable, perhaps even unrecognizable to most. It is just such a beginning that gave life to the art of creator, Heather Theurer. Paintings were born from 5:45 a.m. mornings during summer breaks from school in Paradise, Utah, waking up to breathe in the crisp air and watch the sun rise and glow through the blades of grass in the lawn. Ideas sprung from thunderstorms, the struggles of working on a small farm and from the loyal companionship of pets. Personal experiences combined to shape the narrative behind each forthcoming creation.